Years ago started a I thread on a C64 forum with mockups of how C64 versions of various games could have looked if they had been ported to the system. 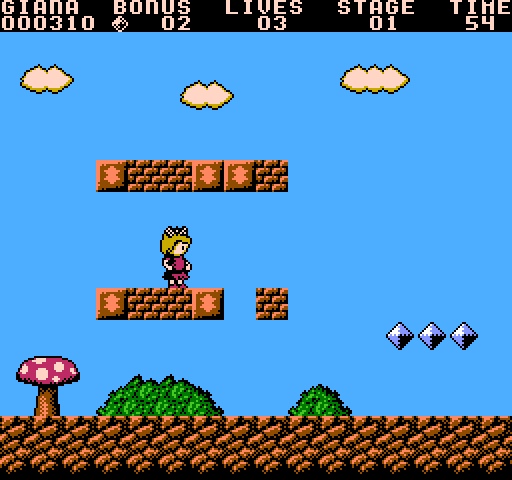 After playing around with NES Screen Tool for the first time in quite some time while making the Mini SMB mockup I thought it would be fun to make a mockup of how the most "Nintendo" game of all on the C64 could have looked if it had been ported to the NES - The Great Giana Sisters! Anyway, here is the picture. Hopefully othere people will think this is a fun idea and will post their own mockups in this thread! You did a good job there. I might see what I can do. And they'll look pretty much the same, given the platforms' different pixel aspect ratios (3:4 for NTSC C64, 8:7 for NTSC NES). Like Apple II tiles, C64 tiles are 14/2 = 3.5 color burst periods wide. NES tiles are 16/3 = 5.33 periods wide. Thus a 3-tile-wide C64 metatile is worth 63/64 = 1.97 NES tiles. You can place a block that's not grid aligned so long as it has empty or same-palette tiles on the unaligned sides. Anyways, I spent some time on another mockup, this time it's Rick Dangerous that got NES:ified by me. I didn't do any sprite at all this time. That's pretty awesome. 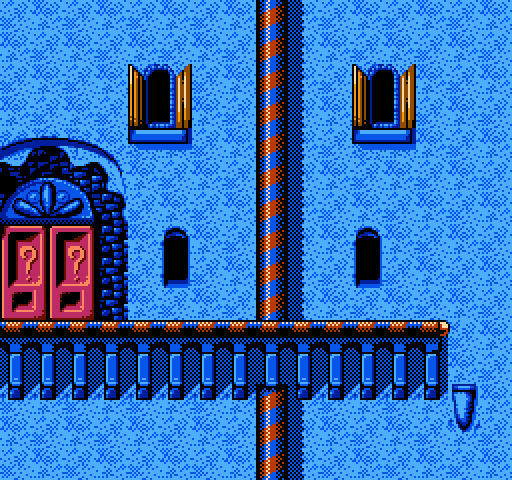 I've followed the NES->C64 mockups and the other way round reminds me of Euro NES designers; eg: Dracula, etc. on the NES. That's pretty cool. At one point I considered making my game dual NES/C64, but the graphics from both machines are like as far apart as they could be, while one is not technically superior to the other, each one can't (easily) reproduce what the other does. The drastic change in resolution doesn't help at all either. So I pretty much gave up that idea. Even if graphics wouldn't be a problem controller would, the standard controller for a C64 game is the joystick , and you only have 4 directions and 1 button (some have 2 buttons, but they are the same for the software). You could use the keyboard for more buttons, but it doesn't have a D-pad, and requiring the user to use the joystick and keyboard at the same time is ridiculous. 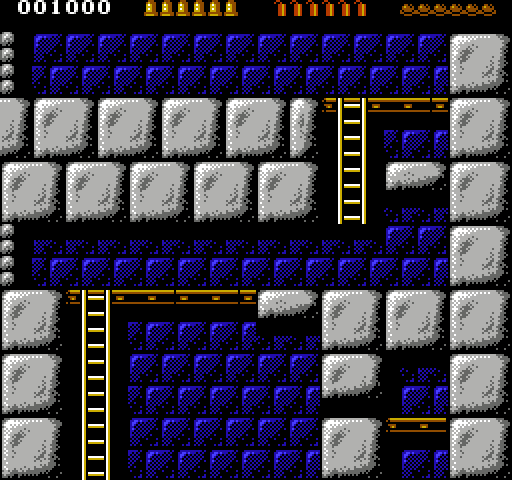 You could probably handle the background by just making two separate tilesets, but that won't help you with sprites (which is where it gets really tricky as sprites have nothing to do with each other between the NES and C64). As for the controller, from what I've read the two button controllers map themselves to impossible combinations of up/down and left/right. The problem is that this means you can't mix button 1 with up or down, and you can't mix button 2 with left and right. Maybe I'm mixing this up with something else but I recall that setup existing. Yes, I have been toying with the idea of porting Driar to the C64 and thought about most of those thing. For Driar I would probably have him always run instead of using up for jumping, but for most games the "up" to jump would be the only "decent" solution. I'm so used to "up for jump" so I don't have a big problem with it, but I know lots of people do. Anyway, another day, another mockup. This time I used the Amiga version of Robocod as my source. This was definitely the mockup that has taken the longest time to make. Well my game is top-down view and has no jumping, A is for shield and B for attack. If I was porting this to the C64 I'd probably have to remove the ability to shield, which in turns would make significant changes to the gameplay. You can't shield and move at the same time (otherwise the game would be a pushover ), so pehaps support for those special 2-button joystick could be added. However, I don't know any C64 game that REQUIRES those joystics. The other option is requiring 2 standard joysticks (for 1 player) and use the second one only for the button, to shield. However, that'd be almost as ridiculous as having to press a keyboard key to shield. I don't think UP for jumping is a problem with joysticks, in fact it's pretty much a standard. HOWEVER with a controller, that's a no-no. It's a huge difference, with a joystick you just move your wirst up, however with a controller you should move your left thumb up which is much more tiring and harder to do efficiently. As for sprites, it's without a doubt the worst to port. The best idea is to have monochrome sprites for black (or whathever colour) outline, and use multi-coloured sprite with lower priority for the texture. If a few textured pixels are off it's no major problem, and you even have a 3rd colour to compensate. 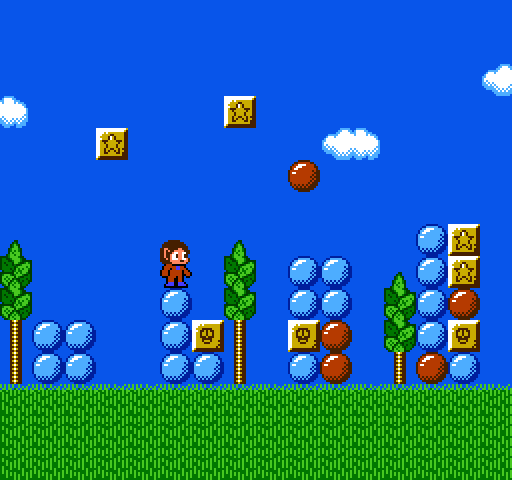 However, the sprite's size total mismatch between both platform is a major issue. The background is not much better since your working area is 40x25 tiles instead of 32x30, this implies a lot of changes. In fact I came to the conclusion that moving the status bar to the left or right of the screen (to keep the 32x24 tiles "screen" of my game intact) would be the only solution without re-designing the entiere levels. Yes this is a big problem, I have been toying with the idea of making a Zelda type game for the C64 and have been thinking about controls quite a lot. And since Zelda uses 3 buttons (A, B and Start) this makes it even worse. Golden Axe Warrior managed to get by with two buttons quite decently by only having one action-button and one menu-button but a secondary attack really would have added to the game. I was thinking about going the Golden Axe Warrior route with two buttons - supporting two button joysticks/joypads and make the spacebar act as the second firebutton for players without a 2 button joystick for the C64 (such as myself). Another solution would be to make some sort of press and hold the button to access the menu solution, this is what Wonderland does and it actually works quite well. I usually use a Sega Master System gamepad with my C64s and Amigas and am very used to playing with them. I can complete Giana Sisters and Turrican II with no problem. Actually for Turrican II on the Amiga it really makes the game easier since they use the second button (or spacebar for people without it). I would prefer jumping with a button, but since I have been playing this way since the 90s it feels very natural and works well enough. I did some more work on the Robocod mockup, toned down the pattern on the walls a little, and added in the color for the "doors?" on the windows, these would have to be sprites to make this possible on a NES. I also redid the pillars to how I would have done them, doesn't look as close to the original anymore but I think they are more pleasing to the eyes. There are some other hardly noticable touches here and there. I'm on a roll now, here's Penguin Land, a Master System game I think is very underrated. Don't really like the player sprite, he gets a little lost in the background, and the spikes coming out of the box doesn't really look good either, the should be a little narrower. Oh well, it's just a mockup. Auto-shield when not moving or attacking. I think The Legend of Zelda does this. Yet games like Street Fighter II and Super Smash Bros. get away with it. Is Penguin Land anything like Duck Maze? Heh, I remember trying that on an emulator ages ago and thinking what a blatant Penguin Land ripoff it was! 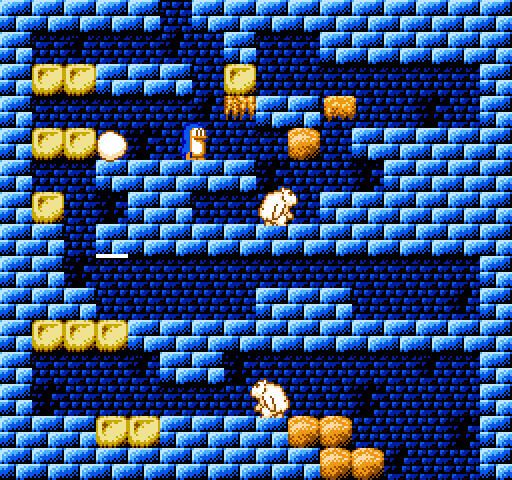 It's pretty much the same game except Duck Maze plays very badly compared to the Master System version of Penguin Land. It plays more like the original SG-1000 Doki Doki Penguin Land - which oddly enough got an arcade port which basically ran on SG-1000 hardware. The Master System version of Penguin Land is IMO a lot better and plays way smoother. It's actually considered the sequel and not a remake.